Upscale Texas grocer Central Market puts on nine to 10 festivals each and every year. Each two-week festival features unique products sourced specifically for the festival, special cooking classes led by top chefs or expert makers, prepared festival foods available in the chefs’ cases, and in-store tastings and other events. For the inaugural Bacon Festival, Central Market wanted to feature the varieties of bacon (there were a lot) that they were bringing in for the event. 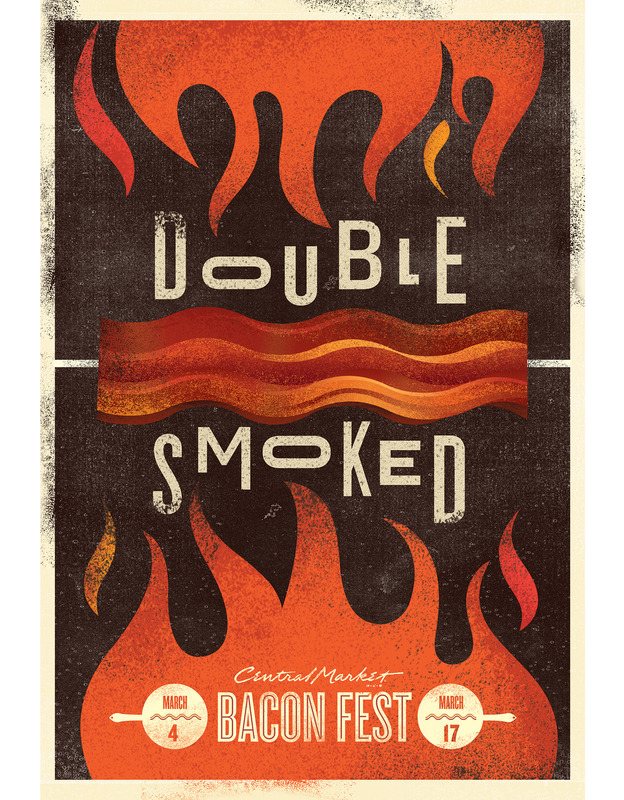 We created a series of illustrations that we applied to posters, the festival microsite, and social media assets, that spotlighted everything from duck bacon (yes, it’s real, and amazing) to veggie bacon to applewood bacon smoked in-house. We designed just about everything for the event: in-store posters, a festival website, T-shirts, tote bags, employee uniforms, bag drop promotions, print ads, digital ads, and in-store displays. Here’s just a taste of what we did.